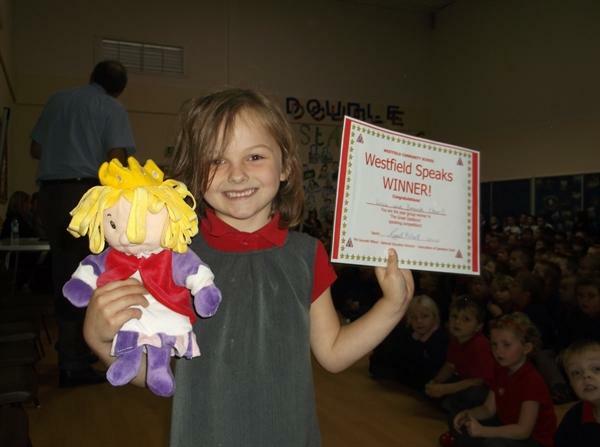 The winners were announced in a special assembly on Wednesday afternoon. 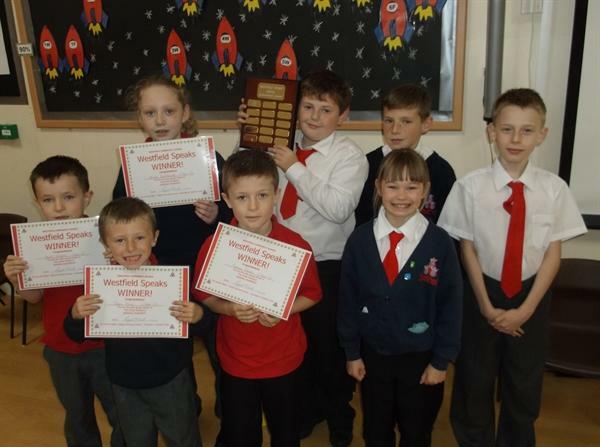 Mrs Millard was a special guest and presented the certificates and prizes to the winners. The finalists' videos were shown on a large screen and then the winners were announced on screen. 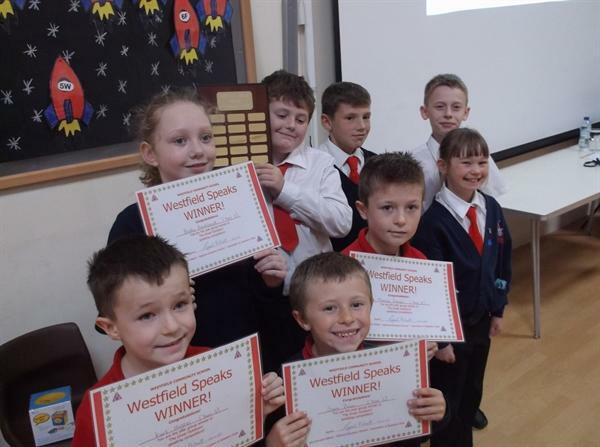 A special achievement award was presented to the team effort from Y6F. Mrs Millard explained that it is difficult to speak in a team and get timing correct, but the Y6F team showed great skill in presenting. 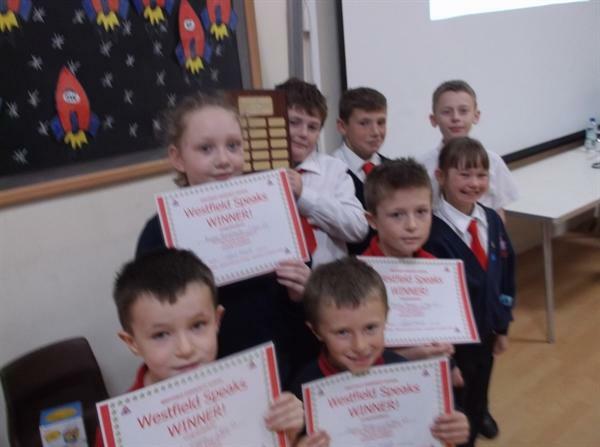 Special Achievement award Y6F Team: Emily, Kyle, Dylan and Aidan. Have a look at the photographs at the bottom of the article. You can see the videos from the day here. Speaks! 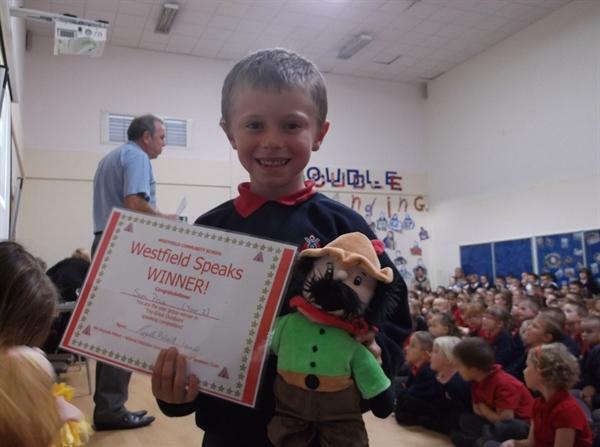 Latest news and Finalists! 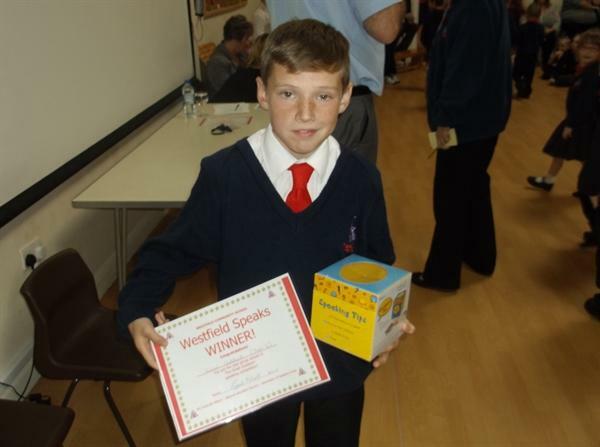 The final took place on Thursday 3rd October and was judged by Mrs France, Mrs Penman, Mrs Roche, and Miss Oddie. Also on the judging panel was Mrs Gwyneth Millard, (National Education Director - Association of Speakers Clubs). It was a fantastic day and the finalists were supremely confident and well-prepared. 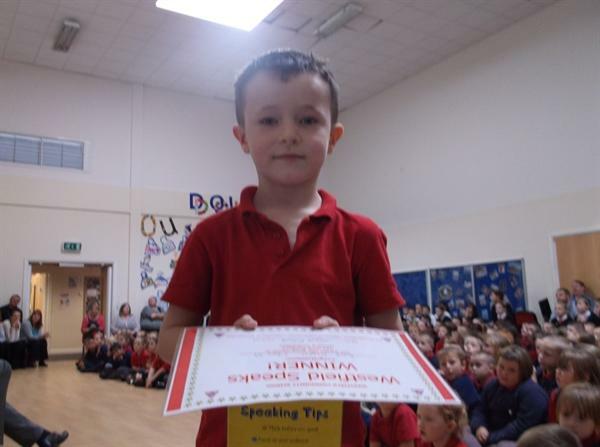 The judges were amazed at the variety of ‘Great Outdoors’ topics and the imaginative props. 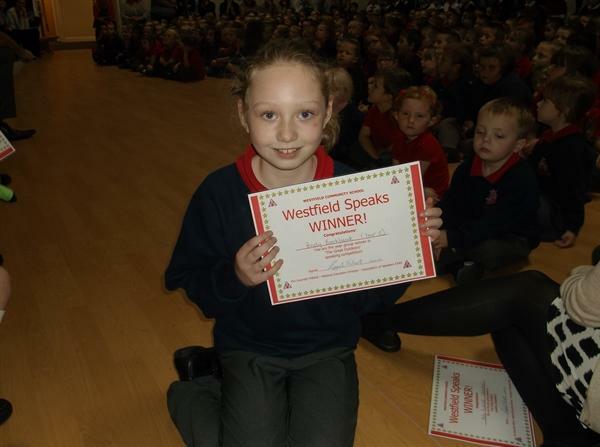 Throughout the day, children showed all the skills of public speaking…. Loud and clear, expressive, good use of notes, eye-contact, clever use of props and gestures. WOW! What a dilemma for the judges! 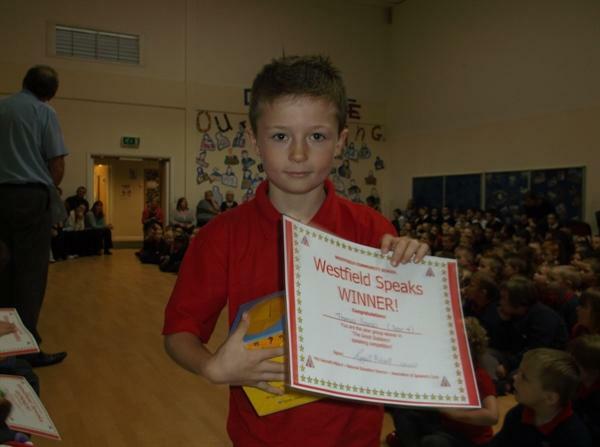 However, decisions have been made and year group winners will be announced at a special presentation next Wednesday! Congratulations to ALL the finalists – you were DOUBLE- OUTSTANDING! Reg 1: Team entry: Kaylum, Cameron, Lacie, Megan, Libby, Kimi and Charlie. Pre-school: Team entry: Nicole, Chloe, Evan, Connor and Nicola. 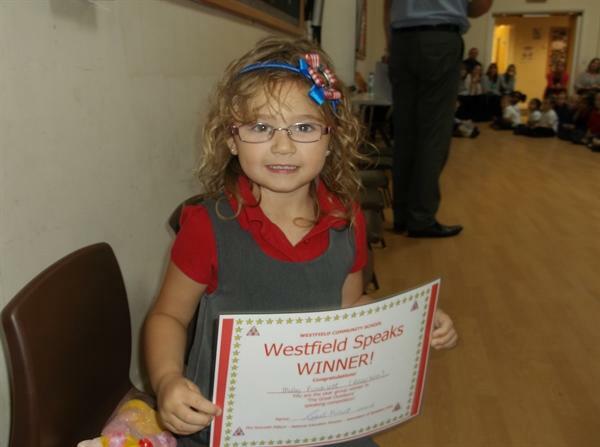 Reception W: Team: Milly, Aaron, Emily-Mae, Elise and Maisie. Reception F: Neve, Leon, Bobby. Year 1W: Team 1: Letitia, Niamh, Amber F, Amber and Star. Team 2: Marli, Abigayle, CJ, Duncan and Callum. Team 3: Codie, Joshua, Ryan, Bailey, Logan. Year 1F: Team 1: Livia and Dominik. Team 2: Braydon, Adam and Luke. Team 3: Ruby and Katie. Year 2W: Isobel, LJ and Hannah Pearce Conway. Year 2F: Kamilla, Harvey, Corey. Year 2WF: Holly, Sam and Kara. Year 3W: Paired teams: Ryan O and Ryan G, Tamsin and Jessica, Lilia and Yesmin. 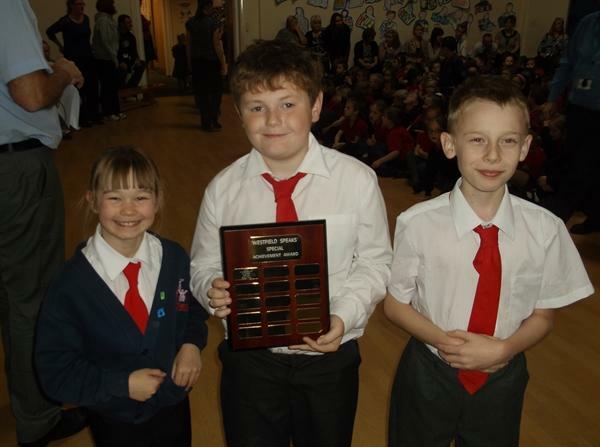 Year 3F: Aimee, Kurt and Callum. Year 4W: Lewis, Casey and Callum. Year 5F: Brody, Katie and Chloe. Year 6W: Keegan, Liam and Alicia. Year 6F: Alex, Eleanor and as a team: Emily, Aidan, Kyle and Dylan. Year 6WF: Lucy, Katy and Kian.